Merudand Aashan : Stand straight and lift your hands up along with breathing in .Bow down forward while breathing out, contract stomach inside and try to touch your feet. After a while stand straight up while breathing in. Then bend your spine backward as much as you can . Then bend forward backward. Repeat the same bowing backward, right side and left side this is one cycle and repeat as many cycles as you can. Then rotate your spine clockwise and anti clockwise, along with your hands keeping horizontally suspended. 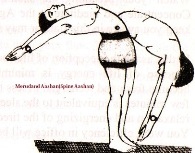 Benefits : This asan especially effects spine, Ida, Pingla, and Sushumna Nadis. It is very useful to reduce the bulging stomach.It reduces obecity and the enlarged spleen and liver. It activates the flow of Prana in the Brahma Nadi , Sushumana and stimulate in awakening the Kundalini. It increases the gastric fire. It stimulates the functioning of abdominal viscera, kidney, liver, dyspepsia and gastritis. It cures piles, prostate, nerves bladder and diabetes etc. This entry was posted in Smart astro guru, Yoga & Kundalini Shakti and tagged benefits of merudand ashan, Merudand asan, Spinal cord Ashan by R. N. Sharma. Bookmark the permalink. Usually I really don’t examine write-up about blogs, however wish to point out that this particular write-up very forced myself to perform and so! Your current producing preference is stunned myself. Thank you so much, pleasant posting. When I first saw this title Merudand Aashan and its benefits | Smartastroguru on google I just whent and bookmark it. We? michael actually experiencing as well as enjoying the actual style along with layout of your respective blog. This? s an extremely easy for that sight making this much more satisfying that i can appear below along with visit more on a regular basis. Do you support the services involving away an artist to create the design? Excellent execute!